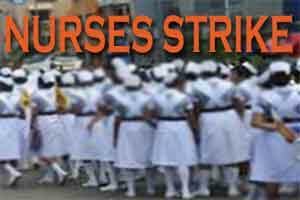 The strike action carried out by nurses of the Sri Jayewardenepura General Hospital for the past 10 days has been suspended following discussion held between hospital authorities and trade unions today (12). The strike was launched against the biometric fingerprint system introduced to record hospital employees’ IN & OUT timing for attendance and overtime calculation. Hospital authorities had stated that the fingerprint system is being introduced by the government and as such they have no say over the matter. During the talks held this afternoon between nurses’ trade unions and hospital administration, it was agreed to provide an opportunity for recording attendance under the old system of singing a document until the issues pertaining to the fingerprint system are resolved. Meanwhile it was decided that discussion on consumer issues would be carried out by the ministerial committee. After these assurances were given in writing, it was decided to end the strike.